Flying low along the Mexican line in a Black Hawk helicopter, the United States Border Patrol officer saw surveillance towers rising above the cactus. 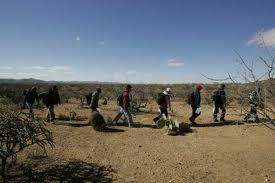 He saw his agents’ white and green trucks moving among the mesquite, scouting for illegal crossers. Far overhead, a remotely guided drone beamed images of the terrain to an intelligence center in Tucson. Pilots cruised in reconnaissance planes carrying radars and infrared cameras that could distinguish a migrant with a backpack from a wild animal from many miles away.